Graphite, acrylic & digital. 8.5 x 7.5 in. 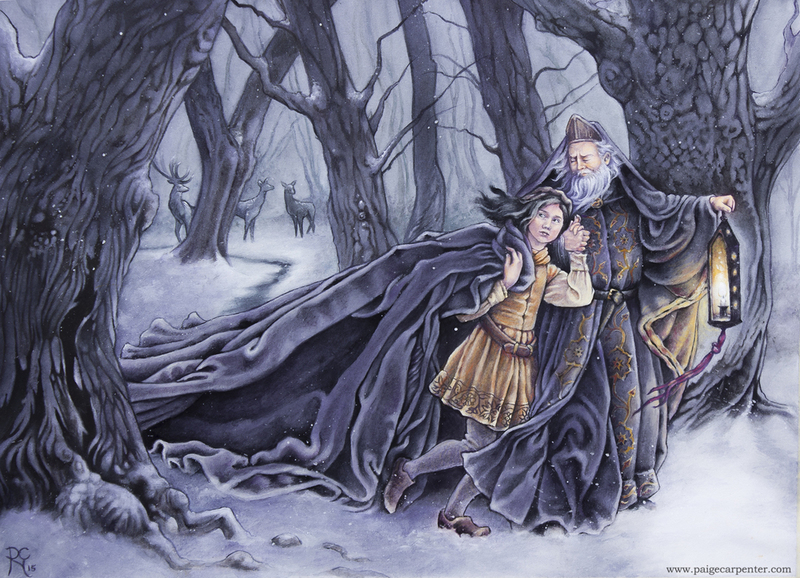 "Defense Against the Dark Arts" for the Month of Love Challenge, Week One: Heroes. Severus Snape is, in my opinion, one of the best & bravest characters in literature. He's certainly inspired me with courage during the hardest times in my life. This is also a tribute to Alan Rickman, who passed away last month. I had always hoped I'd have the chance to meet him and thank him for his wonderful performances in so many films. Still round the corner there may wait A new road or a secret gate, And though we pass them by today, Tomorrow we may come this way And take the hidden paths that run Towards the Moon or to the Sun. See the graphite drawing here. "She cloaked herself in feathers of blue and green..."
A tiny original painting now for sale on Etsy. Acrylic & acryla gouache on Arches paper, in a vintage metal frame. The painting measures 3" in diameter, with frame 4" in diameter. The frame includes its original backing by E.A. Riba Co of New York. Wayward Sons. Acryla gouache & acrylics. 10.5" x 15.5". Finally finished, after a long uphill struggle. I discovered the magic of flat brushes, acrylic retarder medium, and leaving some edges blurry and undefined. Two brothers against the world, and occasionally, against each other. "There ain't no me if there ain't no you." Graphite & White charcoal on toned paper, 11.5" x 8". Scott Fischer's assignment for our fall class was to create a sort of metaphorical self-portrait. I decided to draw a child in the woods. I grew up in rural New Hampshire, and since I was homeschooled I had hours in the afternoon to wander wherever I wanted in the woods surrounding our house. For the Month of Fear Challenge, Week Four. Graphite and charcoal on toned paper. Baldr's Murderer, crowned in mistletoe. For the Month of Fear Challenge, Week One: Villains & Anti-Heroes. Graphite and charcoal on toned paper. Jewel-Glad (Menglod). Acryla gouache & acrylic. 24" x 24". The finished painting based on my drawing from the Month of Love challenge. Menglöð, from Norse myth, whose name means “jewel-glad.” Her beloved, Svipdag, endured many trials to win her hand in marriage. Sabriel. Acryla gouache & watercolor. 9.5″ x 15″. "'Astarael, the Sorrowful,' whispered Sabriel. Astarael was the banisher, the final bell. Properly rung, it cast everyone who heard it far into Death. Everyone, including the ringer.” -Sabriel, Garth Nix. My portfolio site is finally up and running! Take a look. Also, come find me on Instagram, where I post in-progress photos and other goodies. Forbidden Fruit. Acryla gouache & watercolor. 15" x 10". Now when all-seeing Zeus heard that Demeter would let nothing blossom or bear fruit on the earth, he sent Hermes to win over Hades with his soft words, that he might return Persephone to the light, and that her mother might see her and cease from her anger. And Hermes sprang down to the hidden places of the earth. He found the lord Hades in his house reclining with his shy wife at his side. Though he said this, Persephone was filled with joy to return to her mother. So Hades gave her sweet pomegranate seed to eat, the food of the dead, which the living must not eat, so that she would return to him and her mother could not keep her away forever. Then Hades prepared his deathless horses and his chariot. And Persephone mounted on the chariot, and strong Hermes took reins and whip. Swiftly they traversed their long course, and neither the sea nor mountains checked the speed of the immortal horses, but they cleft the deep air above them as they went. And Hermes brought them to Demeter. Because Persephone had eaten the food of the underworld, she was forced to return there, one month for each of the six seeds she had eaten. So during in the autumn and winter, Demeter mourns for her daughter and the earth lies barren. But in the spring, when Persephone returns to her mother, the earth blooms and bears fruit once again. The text of the myth is adapted & abridged from the Homeric Hymns, based on the translation by Hugh Gerard Evelyn-White. Forbidden Fruit. Pencil, graphite & white charcoal. 7.5" x 11.5". My very belated drawing for the last Month of Love challenge: "forbidden fruit". I wanted to take my time with this piece because the myth of Hades and Persephone is one of the most heart-wrenching in all of Greek myth. 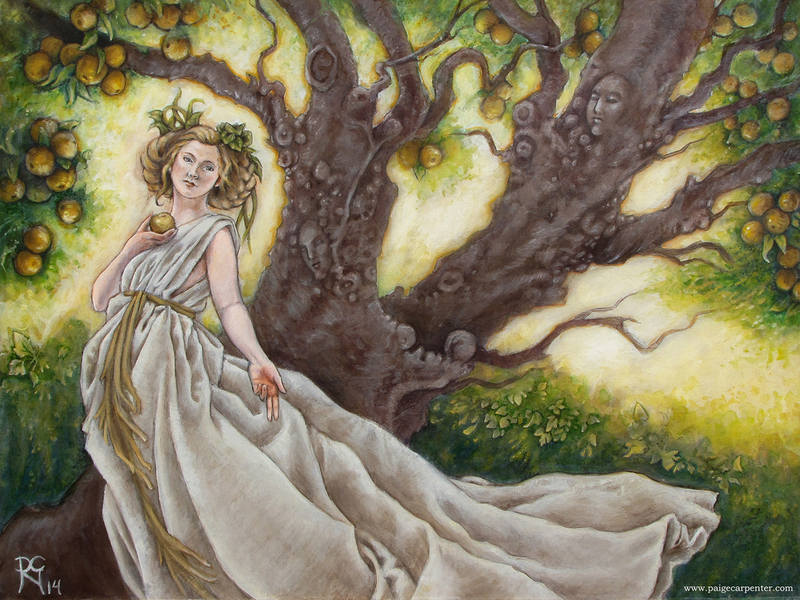 Persephone was the gentle goddess of spring leaves and new birth, had many suitors, but her stern mother, Demeter, refused them all. She hid her daughter far away from the other gods. Hades, god of the dead, passionately loved Persephone, but had no hope that Demeter would ever give her to him. But Zeus told Hades that if he could find a way to take her, he could keep her. Bitter pain seized Demeter’s heart, and she tore the covering upon her divine hair. She sped, like a wild-bird, over land and sea, seeking her child. But no one would tell her the truth, neither god nor mortal man; and of the birds of omen none came with true news for her. 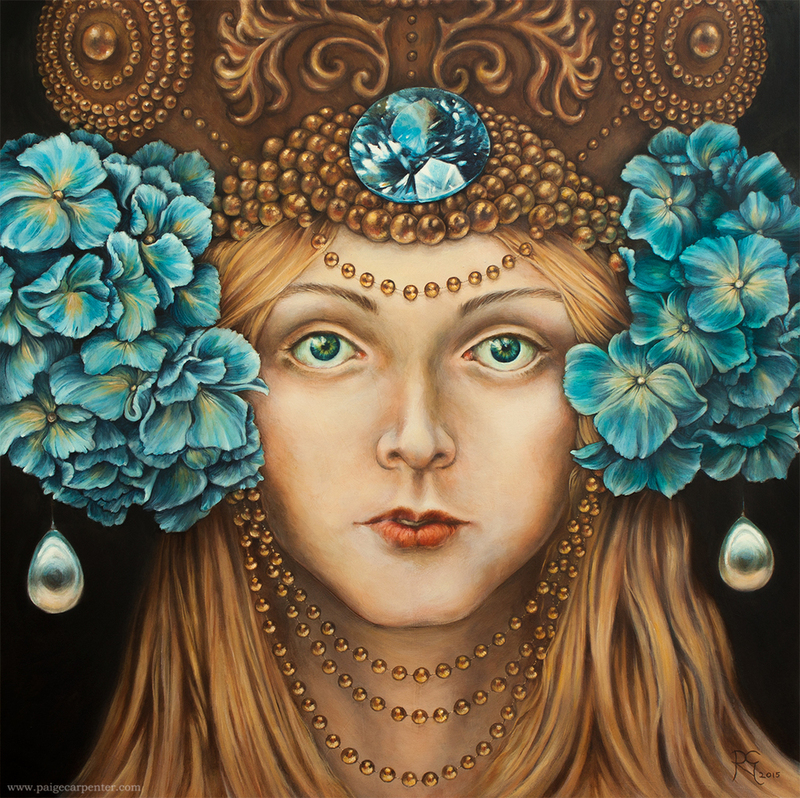 Grief yet more terrible and savage came into the heart of Demeter, and thereafter she was so angered with Zeus that she vowed that she would never let fruit spring out of the ground until she beheld with her eyes her own fair-faced daughter. And so the earth knew its first winter. I'm in the process of turning this drawing into a painting, and I will post the conclusion of the myth along with the finished painting. Fëanor. Watercolor & acryla gouache. 9″ x 8.5″. I asked other SmArt School students to play art director and choose a thumbnail. Nearly everyone liked #1 the best, which was also my favorite. King Wenceslas: The Rude Wind's Wild Lament. Acryla gouache & watercolor. 14.5" x 10.5". A belated Christmas piece for one of my favorite carols. Wenceslas I, Duke of Bohemia, and his page, Podevin. He was made a king posthumously because of his heroism and kindness to the poor. This is my latest experiment in acryla gouache. I feel like I'm still muddling around, trying to learn how opaque paint behaves. The paint in my last pieces in acryla gouache felt very thick and clumsy, Dark Angel especially. Another "problem" with the medium is that a very limited variety of colors are available. I own many more watercolors in the earthy tints I love. For this piece, I decided to do a watercolor underpainting to establish the colors and values as far as I could before switching to acryla gouache. I'm very satisfied with the results, though it wasn't until I was nearly finished that I got frustrated with my stubby 00 brush and went out to buy some decent brushes. On the right, stubby brush. On the left, my two wonderful new liner brushes. Dark Angel. Acryla gouache on watercolor paper, 9" x 14.5". My finished final painting for SmArt School, a spec comics cover for Karen Berger, former AD of Vertigo Comics. The assignment was a half-angel/half-demon lady confronting a mortal man in a cemetery. I imagined the guy as a sort of hunter, like Dean Winchester of Supernatural. He went into the cemetery to hunt and kill a legendary monster. (People who go looking for trouble generally find it.) She appears in a cloud of rubble and mist. He lies stunned and dazzled by her beauty. He hesitates a moment. Only a moment. Just long enough for her to strike. Acryla gouache still feels very thick and strange after years of watercolor. On my next piece I'll be trying much thinner layers. Maybe a watercolor underpainting as well so I can get some of the familiar flow and texture I love so much. 14" x 10.5". Acryla gouache & watercolor on paper. 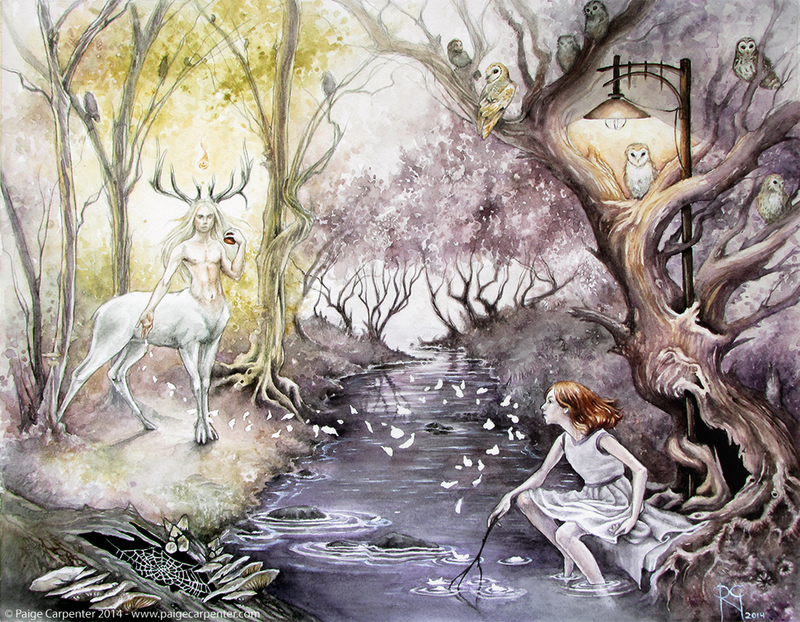 My second SmArt School assignment with Rebecca Guay, and my second painting in acryla gouache. Learning an opaque medium after years in watercolor is a daunting experience. This painting has been on many adventures. I put on the first brush strokes in the mountains of North Carolina, in hours I snatched in the early morning before we hit the trails, and in the evening by lantern light with campfire smoke blowing in my eyes. I brought the painting home to Texas and finished it, only to have Rebecca tell me that it wasn't finished at all. After more hours of love and frustration, here it is. I'm once again calling it finished. The Unquiet Thought. Acryla gouache & watercolor on paper, 9" x 13". A while ago, I read that one of Loki's kennings* is 'The Unquiet Thought.' I haven't been able to trace that kenning to its source, but it certainly fits him. There is nothing quiet about Loki. He is restless as the wind. He wanders through the Nine Realms, never truly at peace. His thoughts are haunted, and he haunts the thoughts of others. 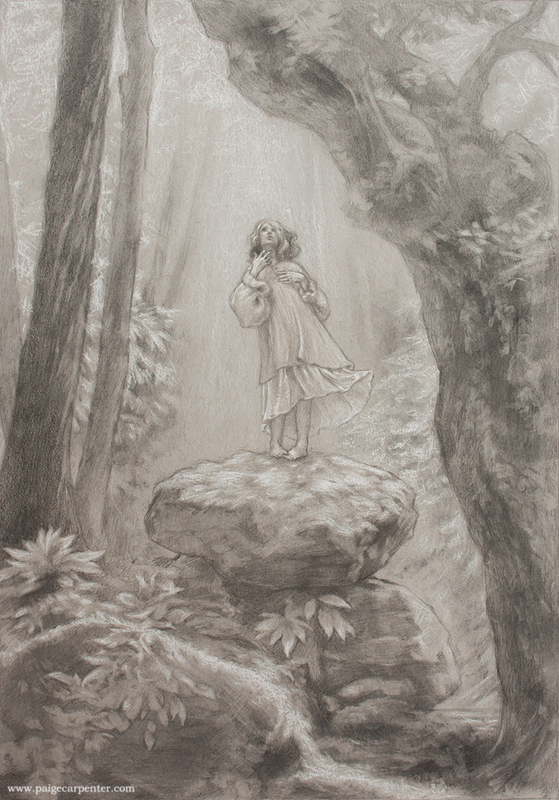 This was my first assignment for Rebecca Guay's SmArt School class. She wanted me to use a new medium-- acryla gouache. It's a strange medium. The paint feels almost rough on the brush. I miss the jewel-like clearness of watercolor, but I love the opacity and color of the skin tones I can create with acryla gouache. *A kenning is a poetic name for something or someone, like calling thunder "Thor's Laughter," or Thor himself "Mjolnir's wielder." Read this article for more about kennings. Watercolor and gouache on illustration board. 14.5" x 18.5"Click for larger image. Owl-light is an archaic term for dusk. If you linger in the woods at dusk, you never know what may step out of the shadows. Watercolor on illustration board, 5" x 7". 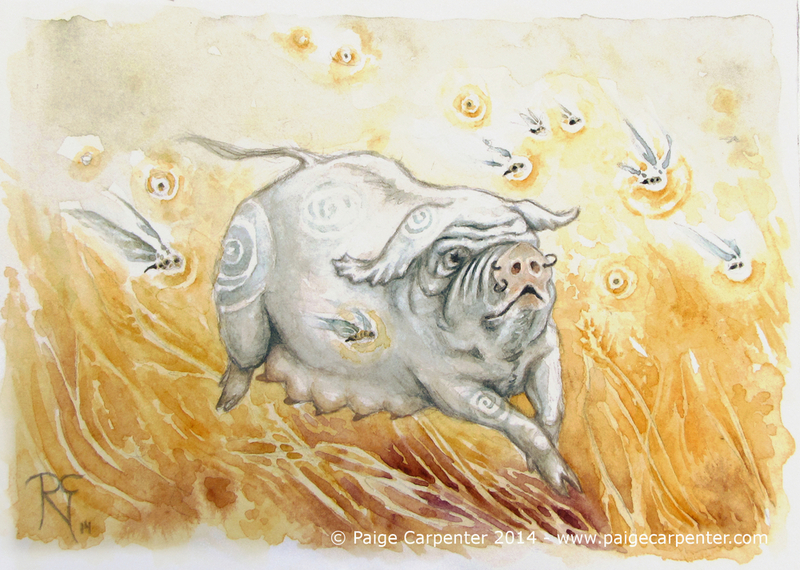 In Welsh myth, Henwen the White was a magical sow who became pregnant and went running madly across Great Britain. She was followed by bees and the earth under her hooves grew warm and fertile, and the wheat turned gold. King Arthur hunted her for a time. 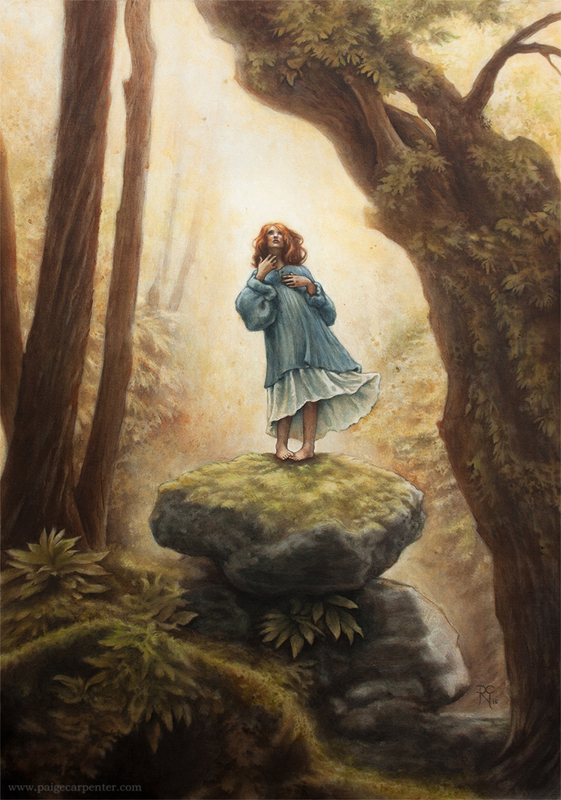 The original painting of Henwen is for sale on Etsy. Freyr - Pencil and white pastel on toned paper. Freyr, the twin brother of the lovely Freya: he was the Norse god of summer warmth, fertility, and peace. Freyr's coming meant the end of winter and darkness. Freyr’s name is really a title, meaning ‘lord’, while Freyja meant ‘lady’. He is associated with the boar: a very large, very fertile, very ugly animal. I tried to make this boar look appealing. (This is not Freyr's dwarf-made boar, Gullinbursti, whose bristles supposedly shone in the dark. I wasn't in the mood to draw crazy!Steampunk!boar.) I named this boar Mr. Tusky. Very Norse, I know. Freyr was given Alfheim, the land of the Elves, as a tooth-gift. (It was tradition to give a child a gift when he cut his first tooth, like the way people give christening gifts nowadays.) I imagine him being rather Elvish in appearance as well, very different from the bearded Thor and the war-loving Aesir. In Gisla Saga a priest of Freyr died, and it was said that he was so cherished by Freyr that the god ‘would have no frost between them’, and so no snow nor frost ever lay on his mound. At Ragnarok, Freyr will ride into the last battle armed with nothing but an antler, as he left his sword with his wife, Gerd.